It's getting to be wintertime. You need a soundtrack for this. And a fireplace, and another body. I mean, I can help you with the soundtrack part. But you're on your own for the rest. And if you don't have all the rest, fine then. I've got the perfect emo album to listen to while you watch the rain hit the window. Life is always hard for the belle of the boulevard. 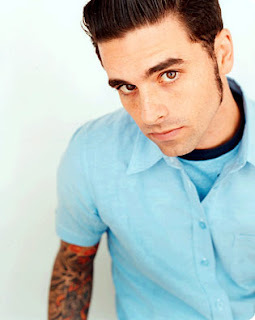 It's about that time for Chris Carrabba to give us a new album. It's a double album, so why don't you go ahead and listen to Side 1 for your angst-filled lonely drives and Side 2 for those evenings with wine and fires (No! Stop! Romantic wine and fire. No setting fires!). Alter the Ending is a collection of 11 tracks performed with the energy and devotion we know and love from Dashboard Confessional, and the same 11 tracks repeated in acoustic form. No new and eye-opening themes or lyrics. In fact, Chris seems to watch the sun go down a lot. But it's OK. I like the way he has described this romantic occurrence throughout his past work, and watching it "burn down into cinders" is not a bad picture to paint is it? And really, you'd listen to this guy sing about his bowel movements. Admit it. What! Don't be annoyed. This is a fluff piece for a fluff band that you love to love or hate to love or love to hate but it makes you feel SOMETHING! I listened to Them Crooked Vultures hoping to review them for this post (maybe you weren't aware how much I love Dave Grohl?) but it made me feel NOTHING! So Dashboard Confessional is what you get, since their album was released on November 10. And it's kinda like winter. And you want to get cozy. Or you want to be sad and alone. So here's the next track I will share with you. Just don't cut yourself. What. I like it when people shorten old idioms. Water. Bridges. Deal.